Judson L. Pierce is a graduate of Vassar College and Suffolk University Law School where he received his Juris Doctor. Mr. Pierce concentrates his practice in representing injured workers before the Department of Industrial Accidents. Mr. Pierce is admitted to practice before courts of the Commonwealth of Massachusetts and the United States Supreme Court. He is a member of the American Bar Association, the Massachusetts Bar Association, the American Association for Justice, and Massachusetts Academy of Trial Attorneys (MATA). He is also a member of the Workers’ Injury Law and Advocacy Group (WILG). Mr. Pierce has served on the MATA Board of Governors as the chairperson of the New Lawyers division and currently serves as a co-chair to the MATA Workers Compensation Section. He has lectured on workers compensation law at numerous MCLE seminars. He formerly served in the Massachusetts Attorney General’s Office’s Fair Labor and Business Practices Division. Mr. Pierce has been selected as a Super Lawyer/Rising Star since 2005. Mr. Pierce was elected to the Arlington School Committee in 2010 and re-elected in 2013. He has recently been awarded the WILG Top 100 Injured Workers Attorneys in 2014 and Top Attorneys in 2012 by New England Outstanding Young Lawyers. 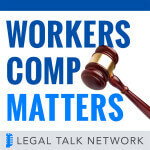 This legal podcast explores workers’ compensation laws that are affected by constitutional law. Guest host Judson Pierce speaks with Workers Injury Law & Advocacy Group President Alan Pierce about the future of American workers’ compensation.